These are the pants you'd wear every day if you thought no one would notice. 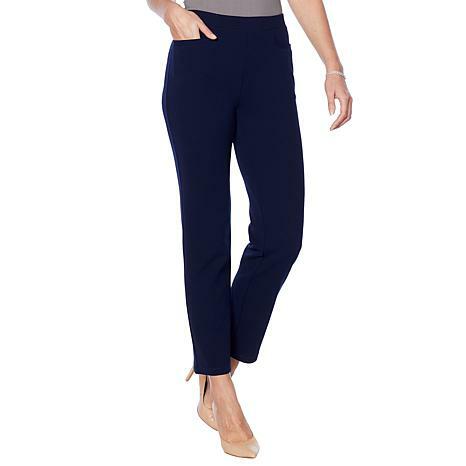 A flattering and comfortable scuba crepe knit, the wardrobe staple is fitted at the hip with a straight, full leg that smoothes and slims your look. These pants are super comfortable and I love the stretch! I am full figured wearing size 16 normally and these are very flattering. 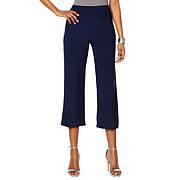 I purchased the black in petite and the navy in regular length. I am 5'4" and feel like the regular length look better on me. This was my first Antthony purchase. I have never experienced a pant that fit me so perfect in my life. I wore these to an interview and felt like I was wearing track pants. Incredible! The fit is perfect, they are comfortable love them! Delicious Feel & Fantastic fit! Antthony, please please please keep these as a standard in your line. The fabric is a weighty, cool, supportive, yet just stretchy enough. 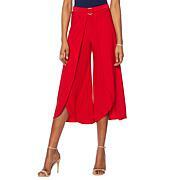 The styling details are clean with deep yet flat-fitted pockets and a good length. The legs are wide enough to breathe without clutching and bunching at the knees yet not too wide. I got them in navy and black and will purchase multiples of them if you get more in stock. I would love a deep olive, chocolate brown, khaki, and dark charcoal. Thank you! Love these slacks~Nice fabric and fits perfectly. Thanks antthony!!! Nothing rings in cooler weather like velvet. 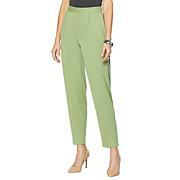 These cozy pants give you plenty of options for versatility. Make late-summer waves by pairing them with tees and moving into fall when you add a jacket and slip on boots.